Here is a top tip to try at home for those of you who want to make home improvements quickly, easily and inexpensively. After all, the more money we save on one home improvement project, the more we have left for all the other ones we want to do. This tip is for those who wish they had more windows and light. It needs very little planning and is easy to do. It’s the ultimate in illusions: brighten, lighten and create a seemingly more spacious area with mirrors. Mirrors can be more versatile than we first think. Placed opposite a real window, a mirror will reflect the view and light of the real window, making it seem as if you have another window where there is not. We’re writing about acrylic mirrors and polycarbonate mirrors because they are much stronger than glass mirrors and don’t shatter in the same way, making them a safer choice. Acrylic and polycarbonate mirrors have made it into our Top Tips because they can be one of the best solutions for the small space owner’s back pocket and bank account. 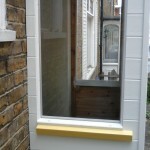 Check out this fake window one of our customers created and sent in to us. The Plastic People supplied the acrylic mirror cut to size, ready to use. Dream spaces might be filled with windows but if this isn’t your reality then try using acrylic mirror or polycarbonate mirror to make a fake window, giving you what you wish was there. If you would like any assistance please let the friendly team at The Plastic People know. Details of their cut to size mirror can be found on their site.